Destructive Storms Soak, Batter And Bury Communities Around The Country : The Two-Way Apparent tornadoes killed at least 19 people in the South, nearly 4 inches of rain caused mudslides in California and a storm is dumping snow and rain from the Mid-Atlantic through the Northeast. Multiple destructive storm systems damaged property and killed at least 19 people over the weekend, and continued to batter much of the U.S. with rain, snow and wind today. 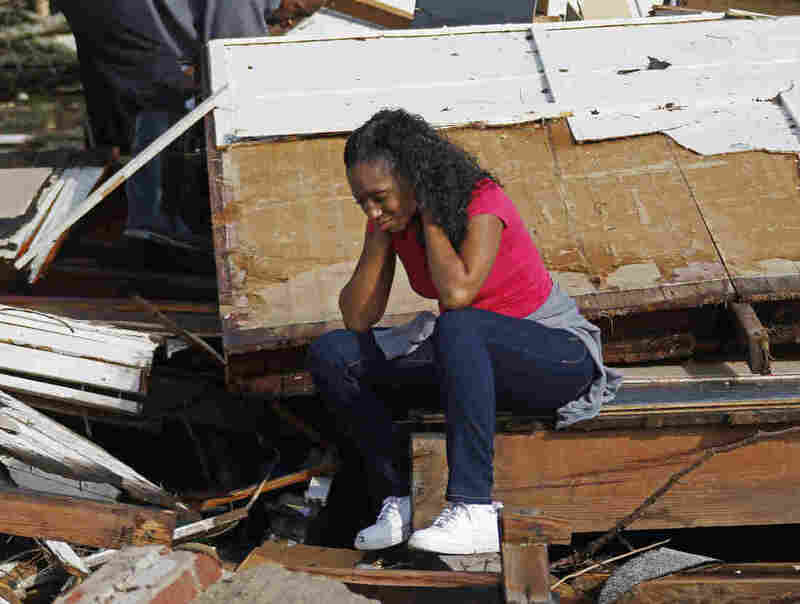 All 19 reported deaths were in the South, where apparent tornadoes ripped through towns over the weekend, damaging and destroying buildings in multiple states. "Trailers are just flat, just laid on top of people," Debbie Van Brackel, a volunteer EMT in Adel, Ga., told the Atlanta Journal-Constitution on Sunday. "You need a bulldozer to pull it off. Trailers are upside down." 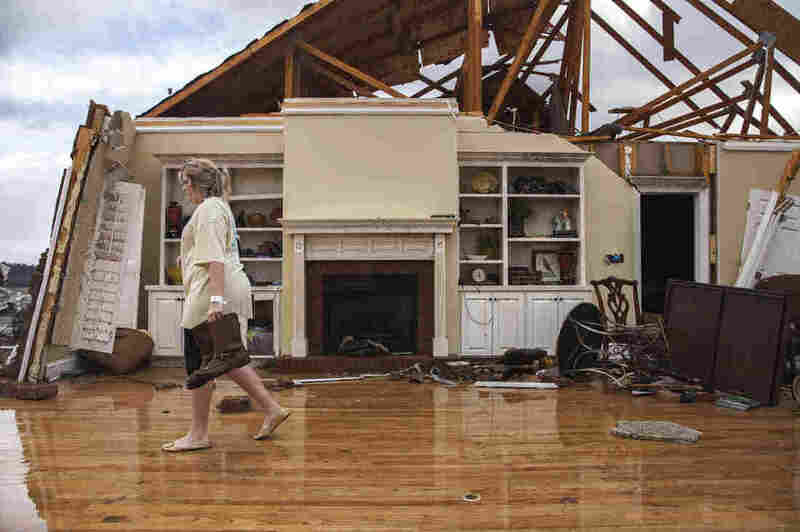 The newspaper reported that 15 people died in the southern part of the state, including seven people in a mobile home community in Adel and four people in the town of Albany, Ga.
Jenny Bullard carries a pair of boots from her home that was damaged by a tornado in Adel, Ga.
Patrick Marsh of the Storm Prediction Center in Norman, Okla., told The Associated Press that 39 possible tornadoes were reported in the Southeast over the weekend. Of those, most were reported in Georgia. The governors of Mississippi and Georgia both declared states of emergency for portions of their states where the destruction was most profound. Mississippi Emergency Management Agency officials confirmed that an EF3 tornado struck three counties in the state, killing four people and injuring more than 50 in Forrest County, according to The Clarion-Ledger newspaper in Jackson. All four fatalities were in the town of Hattiesburg, the paper reported. In Palm Beach County, Fla., where the Sun Sentinel reported the National Weather Service had issued a tornado warning overnight, the school district's Twitter account announced that one of the county's high schools would be closed Monday due to "apparent tornado damage." The NWS warned of winds as strong as 55 miles per hour on Monday morning. Also over the weekend, a separate rainstorm soaked Los Angeles and surrounding communities in Southern California. 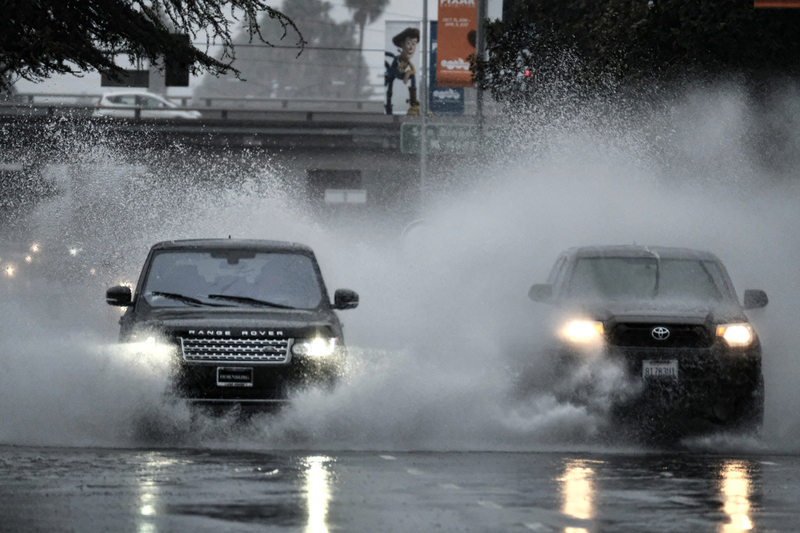 On Monday morning, a National Weather Service flash flood watch was still in effect for Los Angeles and Ventura counties. "Coastal areas of Los Angeles County were among the hardest hit, with Long Beach Airport setting a new all-time rainfall record, 3.87 inches," the Los Angeles Times reported. "The intense rain was too much for local roads. Sunday afternoon, both the 110 Freeway in Carson and the 710 Freeway in Long Beach were shutdown due to extreme flooding that left cars stranded like islands in a lake." A flooded street in the Van Nuys section of Los Angeles on Sunday. Some California residents evacuated neighborhoods below hillsides scarred by wildfires, amid concerns about mudslides. "Today was very intense," National Weather Service meteorologist Brett Albright told the Times on Sunday. "It's not a normal event." The rain eroded hillsides, some them already weakened by wildfires, causing multiple mudslides. The Times noted that multiple cities had issued evacuation orders for neighborhoods near recent burns, including in Duarte, Santa Clarita and parts of hilly Santa Barbara County north of Los Angeles. A hill that broke away in Sierra County, Calif., buried most of a road, according to Caltrans, the state's transportation agency. In Topanga Canyon north of Los Angeles, falling debris closed the road through the canyon on Sunday. At higher elevations, the precipitation fell as snow, closing Interstate 80 completely for a period overnight. And in the Northeast and Mid-Atlantic, another storm was dumping rain and snow and battering coastal cities with wind on Monday. In New York City, "A high-wind warning is in effect until Tuesday, and with up to four inches of rain possible over the next couple of days, a flood watch and coastal flood advisory will take effect this afternoon," The New York Times reported Monday. The National Weather Service warned of gusts up to 45 miles per hour for parts of Maryland, including Baltimore, and snow in the western part of the state all week. A winter storm warning is in effect for parts of central New York state and Pennsylvania until midday Tuesday, and the National Weather Service warned roads would be "very dangerous," asking residents in the affected areas to travel only in emergencies. Around State College, Pa., the NWS predicted between 6 and 10 inches of snow. A previous version of this post erroneously included a photograph of New York City's Columbus Circle that was taken during a snowstorm that hit the Northeast a year ago today.